A beautiful luxury hotel on Ayrshire’s Atlantic coast, set in the 800 acres of private land the five star resort was host to the 2009 Open with its two championship courses, the hotel offers top sporting, leisure and business facilities, as well as high standards of service. The hotel has a luxury spa, which offers a full range of E’SPA holistic treatments including facials, body wraps and hot stone massages. There’s also a pool, sauna, steam rooms and gym. The luxury hotel is great for outdoor types, guests can enjoy horse riding, shooting, falconry, salmon fishing, mountain biking and walking. The hotel has two restaurants, one offers formal dining whilst the other is a more casual place to dine. The luxury hotel’s 219 newly renovated rooms are grand, clean and comfortable with more than a helping of country-house chintzy chic. Rooms come with satellite TV (plus pay movie channel) and high speed internet access. Experience a truly memorable afternoon tea in the Grand Tea Lounge in an atmosphere of relaxed refinement. Our tea sommeliers will guide you through a vast choice of teas, all brewed to order using a traditional samovar. Ailsa Bar & Lounge,the ideal rendez-vous for pre-dinner cocktails and whisky tastings. The Ailsa Bar & Lounge also serves an innovative menu featuring bite-sized Scottish dishes just made for sharing. Duel in the Sun - An engaging and relaxed sports bar offering a large selection of bottled beers, wines and cocktails. The perfect place to enjoy a drink and a snack while watching live sports on one of several plasma screens. Appie Toorie - Situated in the Turnberry Resort's Clubhouse, with stunning views over the opening and closing holes of both the Ailsa and the Kintyre, The Tappie Toorie features the very best grills, pastas, salads and more. The Halfway House - Not only golfers will enjoy a drink or snack after playing 9 holes on The Ailsa, you can also enjoy a pause here after a stimulating walk to the lighthouse and the Turnberry beach. The Ailsa - The Ailsa is currently ranked as Britain's number one golf course by two leading golf publications and consistently rated within the world's best. An Open championship course four times over, this is one of the world's great golfing experiences. The Kintyre - The Kintyre is links golf at its exhilarating best. Undulating greens, glorious fairways, magnificent ocean holes, and all with stunning views of Kintyre, Arran, and the famous Turnberry Lighthouse. The Arran Academy Course - The 9-hole Arran course is a fitting introduction to the challenge of links golf and designed to allow the professionals of the Colin Montgomerie Links Golf Academy to pass on Montgomerie's insights. Colin Montgomerie Links Golf Academy - The Colin Montgomerie Links Golf Academy offers a unique teaching proposition: rather than impose a whole new way of playing on students the pros will nurture each individual's ability and concentrate on one or two critical areas. 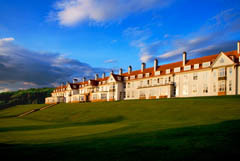 The Clubhouse - The distinctive character and grand design of the Turnberry clubhouse are part of the histories of Turnberry. The clubhouse is stately throughout and offers a wide range of dining and entertaining space, well-equipped locker rooms and Turnberry pro-shop. There are two international airports within an hour's drive: Glasgow International and Glasgow Prestwick Airport. Edinburgh International Airport is less than two hours drive away. Glasgow Airport is the busiest of Scotland's three main international airports. Over 40 airlines serve around 80 destinations. Glasgow Prestwick Airport has flights to and from over 25 European destinations.